Electric consumers across the Midwest should brace for higher electric rates starting June 1, 2014. Capacity charges are passed on to customers from suppliers to recover the cost of keeping enough power plants standing by to meet the system peak demand. To give you an idea of how much they have increased; an Independent Energy Consultants client recently taken out for bid saw Capacity costs account for 29% of their fixed rate as opposed to 7% in their previous supplier contract. Capacity costs are unavoidable and are paid whether an account is supplied by its local utility or a 3rd party supplier. With electric prices increasing as they are, it is important to understand what drives these increases and how to respond to them. While Capacity costs are unavoidable, they can at least be anticipated. The annual cost of Capacity is set by rolling auctions and is known 3 years in advance. Electric generators look at a number of factors to help them predict future demand for electricity and the value of their power plant Capacity. In the PJM market place, Capacity costs are currently set for the next 3 planning years, with the planning cycle being June 1 - May 31. Each of the next three planning cycles is considerable higher than the one that expired 5/31/2014. 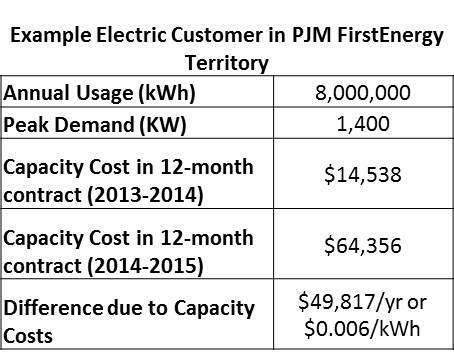 The table below illustrates how Capacity costs can impact a customer setting a new rate after June 1, 2014. The cost of Capacity is on the rise as shown below. These Capacity costs are a "pay-me-now or pay-me-later" charge and will drive the rate of retail price offers for select terms. Customers looking to avoid budget sticker shock should look at longer-term contracts to dampen the rate impact and take advantage of the falling Capacity charges in the planning year 2017. The Capacity costs are set for three years but the largest component of a bill comes from the kWh energy costs and those fluctuate constantly. A good consultant will vigilantly watch energy prices and advise when to go to market. Acting during an energy market dip can help mitigate the impact of rising Capacity costs. Other mitigating strategies include participating in a Demand Response program where reducing load at the request of grid operators can earn extra revenue. Anticipating days of system peak usage and reducing your demand can reduce your "peak load contribution" for the following year. Our experts at Independent Energy Consultants can alert you to these opportunities and recommend strategies that best suit your energy needs.